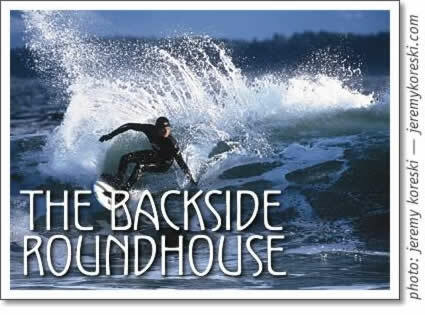 The Backside Roundhouse is a trick that you don’t see people do very often, but it is effective for getting back to the source of the wave where you can get speed for your next move. It also works on your backside cutback and your frontside re-entry on the same wave. Catch a backside wave and cruise down the line. Look for a section just ahead of the bowl that is not going to break, and has a fading shoulder. Start your bottom turn with a maximum amount of speed at a 40 to 50 degree angle towards the open face. Make sure you are far enough in front of the foam ball to do a complete roundhouse and hit the foam ball before it passes you by. Bend your knees and look at the place where you want to start your turn. When you reach the top of the wave initiate the turn by leaning on your toe side rail. Try to pick the perfect spot to start your turn so you don’t have to reset your rail half way through. Use the full length of your rail, and even pressure from both feet to flow smoothly through the turn. Get your body as close to the water as possible, and bend at the knees not at the waist. Place your trailing hand in the water for stability and style. Follow the turn with your eyes following the direction of your board. Once you’ve completed the first portion of the turn you should be focused on the section you’re about to hit on your forehand. Most of your weight should be on your back leg driving through what is now a frontside bottom turn. Go straight up, and hit the steepest section of the lip right beside the foam ball. This section will have the most power so when you hit it you should get a little boost of speed to get back on to the open face of the wave. To get back onto the left you will have to hit the lip and allow your tail to drift until the nose of your board is facing back in the other direction. To do this put a bit more pressure on your tail as your coming off the top to kick the tail out. This will release your fins, and your tail will drift. Stay low and centred. When you land your board will be pointed towards the open face so start your bottom turn and do it again. The backside Roundhouse is a relatively easy move, but if you add tweaks to it, like a straight up frontside hit, it can be as fun as any move. Start out by just getting the backside cutback portion of it down, and then move on to more difficult versions. Tofino surf: Backside Roundhouse is a trick that is effective for getting back to the source of the wave where you can get speed for your next move.